1. Systolic heart failure - the heart does not have sufficient force to push enough blood into the circulation when it contracts. 2. 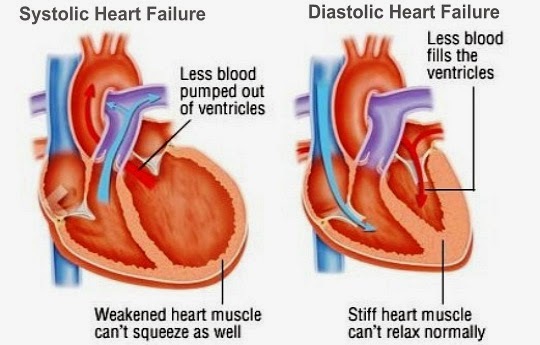 Diastolic heart failure - the heart has trouble relaxing correctly and so becomes stiff and unable to properly fill with blood. It is a condition that increases with increasing age and so is more widely seen in an elderly population. 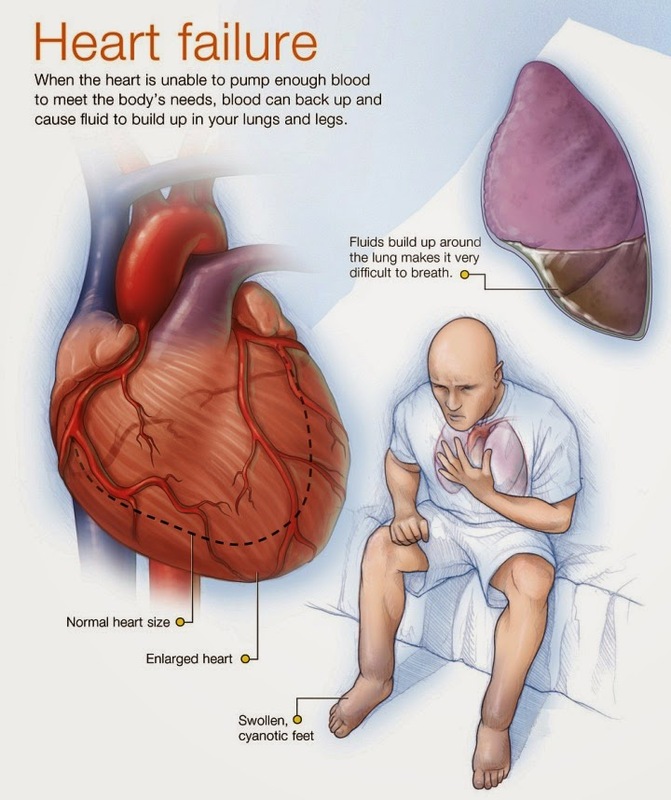 • Heart valve problems e.g. from previous rheumatic fever. There may also be some genetic factors which contribute to heart failure but in most instances a specific genetic link is never established. 3. The pulse rate increases to increase the circulation. However, this compensation is not infinite and signs of heart failure appear once these possibilities have been exhausted. • A chest X-ray. This can show an enlarged heart and the presence of fluid on the lungs. • An ECG (electrocardiogram) which looks at the electrical activity of the heart, and whether it is under any strain. • An echocardiogram (ECHO scan) can tell from harmless sound waves being 'bounced' off the heart whether there are any abnormalities in the heart size, shape and movement, and can also assess just how much blood the heart is able to pump out. • Blood tests are routine, and will include checking for any conditions that could put the heart under strain including anaemia and thyroid problems. These treatments are both medical and self-help treatments (see below). Medical treatment involves the use of drugs which aim to ease the load on the heart, and which include diuretics ('water tablets'), digitalis and angiotensin converting enzyme (ACE) inhibitors which have been shown to improve heart efficiency in patients with heart failure. 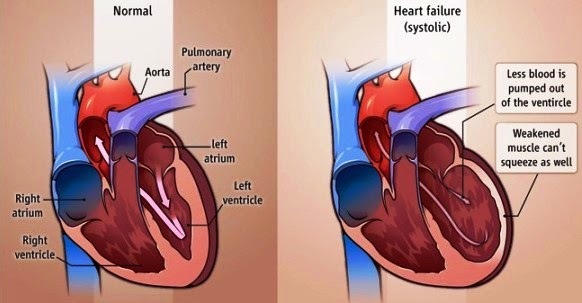 Very rarely, heart failure can become life-threatening - usually when all medical treatments have failed and the heart is unable to compensate any more. In such cases, a heart transplant may be considered but this needs very specialised assessment by cardiac surgeons before a patient is out on the list for such an operation. The majority of people with heart failure are able to lead normal lives, albeit occasionally at a slower pace than in their youth. A steady increase in medication may be necessary with increasing age to maintain the 'status quo' of the heart, along with sensible lifestyle and dietary advice. Patients with heart failure should inform their doctor of any significant change in their condition such as a worsening in their breathing or swelling of their feet. • Stopping smoking - essential. • Eating a low-fat diet if your blood cholesterol level is high. All these factors are essential in the fight against heart disease of any nature and will go a very great way in helping your heart be placed under less strain as a result. 1. Have you noticed your ankles swelling recently? 2. Do you get short of breath very easily when exercising or when lying down? 3. Are you more tired than usual? 4. Do you have any pain in your chest? 5. Have you noticed any palpitations or odd heart 'bumping' recently? 1. How mild or otherwise is my heart failure? 2. Will it ever get better to any degree by itself? 3. Am I allowed to fly? 4. Am I at more risk of a heart attack? 5. What are the side effects of my medication?